On Al @KrestaAfternoon radio show at 5 PM Eastern to discuss Poland and an opportunity to walk in the footsteps of John Paul II. You can listen by clicking the audio link above.. I will be telling of our adventures smuggling Bibles, medicine and money into Poland in 1983 when it was still under the Soviet Union. We have taken pilgrimages to Poland and people are overwhelmed with the beauty, history, Catholicity and friendliness of this country. 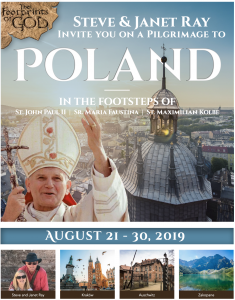 We invite you to listen to this entertaining and instructive interview and check out our very affordable pilgrimage to Poland this August (great time of year to go). Al and Sally Kresta will be our special guests on the pilgrimage! Check it out here. Steve, I know that I have had a scotch or two, but the links in this post do not get me to your talk. Maybe I am missing something. Would love to hear what you had to say. Steve Ray here: Tom, above at the top of the blog post there is a audio bar – click on the arrow to the left and it will play.